The greatest of Frans Hals' pupils is least like him. Yet Gerard Terborch (1617-1681), in his original and individual manner, is among the peers of the masters of the 17th century. Although we may discern some traits of painting, its freedom of execution, for instance, which he must have learned from his master, Terborch developed this in his own way to greater reserve in the splendour of painting, which we so much admire in Hals, preferring rather delicate and moderate harmonies of tone, graduated with exquisite art, yet invariably just in their values. While Frans Hals is boisterous in the bravura of painting, Terborch's brio is more subtle, less emotional, though none the less vivid. The difference of subjects is no distinction. Each painted his own. The common types of Hals accorded with the master's predilection. Terborch, by birth and breeding an aristocrat, painted the elegant manners of the beau-monde. He came from an old family of Zwolle, in the province of Overyssel, where his father was a man of wealth and culture, himself an amateur of art. Gerard's early talent was carefully fostered by his father, who sent him first to Amsterdam, but after a short stay there to Haarlem, where Pieter Molyn, and later Frans Hals, were his instructors. At the instigation of Molyn, English born, he went to London in the beginning of 1635. A letter of advice and counsel, which the elder Terborch wrote to his son, is typical of Dutch character of the time. He	wrote: "Draw constantly, and especially choose large compositions with much action in them. When you paint, treat modern subjects as much as possible. Have regard to purity and freshness of colouring, that your colours may harmonize when they are dried. Above all, serve God, be honest, humble, and useful to all, and your affairs will turn out well." From London he journeyed through France to Italy, where he studied Titian and other masters, without submitting his development to these extraneous influences, or being seduced to imitation. His was a logical self-unfolding of inherent talent, arriving at his maturity through the growth of individual conceptions. He remained Dutch in character, in subjects, and in technic. After a few years in Amsterdam, where Rembrandt impressed him and revealed to him the possibilities of the light of interiors, he went in 1646 to Munster, then the political centre of Europe, where diplomats from all courts were gathered, as well as the delegates to the congress which concluded in 1648 the Peace of Munster, making an end to the Eighty Years' War. 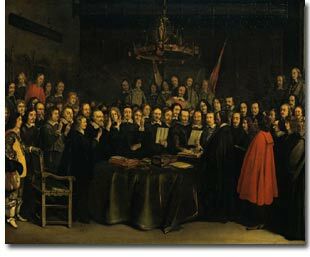 His ability in portraiture is demonstrated in that wonderful group painting, in which he depicts the delegates of the United Provinces and the Spanish Ambassadors, while listening to the oath of ratification of the treaty of peace. It was while at Munster that Count de Peneranda, the Spanish Ambassador, induced Terborch to accompany him to Spain. The artist was received with great distinction, and after painting several portraits, none of which has survived, he was created a Chevalier by the King. His courteous manner evolved into flirtatious conquests of ladies' hearts, which aroused deep jealousy at the court, and our Don Juan had to leave between two suns. On his return to Holland he stayed awhile with his family in Zwolle, and in 1654 married a young woman of Deventer, where he established himself as a citizen, and during the quiet life which followed wrought, in the fulness of power, most of those jewel-like transcripts of the ban-ton, which are now prized so highly. Terborch has given us an intimate acquaintance with the private life of the patrician class of Holland of his time, the family life of the Dutch merchants, the lords of the commerce of the world. With extreme simplicity he shows us the rich and tasteful furnishing of my lady's boudoir, with its red hangings, high marble chimneypiece, its little canopied bed, its table covered with heavy Oriental tapestry. Even her wardrobe we may study the dress of yellowish silk, that of garnet edged with swansdown, the collar of pearls; or again the accoutrements of her visitor in buff jerkin, or dressed in the latest mode with square-toed shoes and profusion of ribbons. He becomes a truer historian than any of the Dutch painters who preceded him. To his excellent drawing, his velvety colour, correct modelling, and his unexcelled facility he adds shrewd observance of salient character, apt commentary, and spiritual conception - thus he found his triumph in truthful delineation without mannerism, without pathos, or dramatic intent, but full of the humour of unconscious spying. The only man with whom in this respect he can be compared is Jan Steen, who likewise had that same naivete to depict character, choosing to see it in the law and gross, as Terborch saw it in the refined and elegant.